Scrangie: Kat Von D Beethoven palette look. So, looks like I have to take back everything I said about these palettes being crappy. They are really nice. Sure, they could be more pigmented, but they're nice and smooth and the colors all work together. 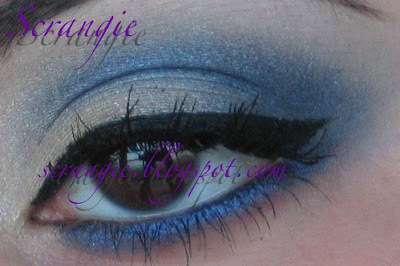 I did a Kat-inspired blue semi-smoky eye with liquid liner because it seemed appropriate. Just an eyeball shot. 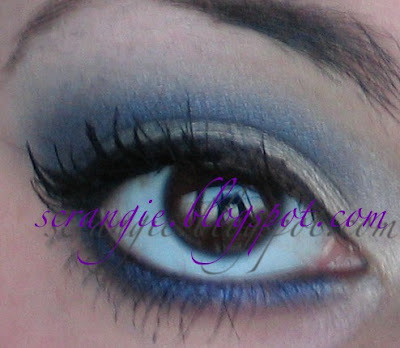 I used the left side of the Beethoven palette (Speed Blue, Raxor Gray, Tequila). *SIGH* I can only do nails, wish I could do make up like that. Aww, makeup was always my first love. Wow. Your blue look is way prettier than mine! :D Awesome! The Kat Von D palettes look nice and feel nice- they have that soft rubbery feel like Nars and Smashbox compacts have.